If you'd like to share the memory of your late XCOM operative with the world, 2K has you covered. You're aiming for the achievement for carrying one soldier through every mission in the game. Now you're on the Temple Ship assault. This is it. Your most veteran Sniper, Aces "Snake Eyes" Ho Duck, has squadsight on a Sectopod when a nearby door opens. Out wanders another Sectopod with chest cannon at the ready. You try to find cover, but the cyberalien explodes it with a single shot. Then he takes a follow-up to wipe out Aces. You may never get a chance to see him on your in-game Memorial Wall, but thanks to 2K, you can now share your loss with the world. In XCOM, each of your fallen soldiers is immortalized on your Memorial Wall which you can access in-game. However, if you lose your operative on the final mission, you never get the chance to see them show up on the wall. This Facebook app gives you a chance to honor your favorite lost soldiers from in-game, by allowing you to name your soldier, customize various attributes to best reflect their in-game character, as well as allowing for a brief eulogy. Perusing the wall, a recurring theme is run-ins with Sectopods, with Chryssalids looking like a solid runner up. The wall certainly paints a grim portrait of the game, which is not surprising, given just how unforgiving it can be on anything but the easiest difficulty settings. 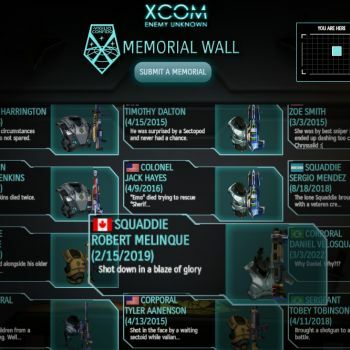 Catastrophic operative losses in XCOM are as old as the franchise itself, dating back to '94, and this memorial wall, while designed for the recent Enemy Unknown, could likely even be used to honor your even-longer-dead brothers in arms. So what's your XCOM horror story? Was your only loss a Rookie, too eager to prove themselves in combat against better-equipped aliens? Or was it your most experienced veteran caught off-guard, dying when your last save was too far back to justify loading? You can tell the world all about it right here.